In a skillet, fry the plantain slices until golden-brown on each side. Then set to the side over paper towels, to remove any excess oil. Next, add the oil to the same skillet over medium-heat and sauté the sofrito mix, tomato sauce, olives, seasonings and cumin. Cook for two minutes. Afterwards, add the ground beef and season as desired. Continue cooking for 10-15 minutes. While the meat is cooking, grease a rectangular or square baking dish with some butter and add half of the beaten eggs. Over the eggs, add the first layer of plantains just as if you were preparing lasagna. Make sure to completely cover the base of the dish. Then place a layer of ground beef over the plantains, followed by a layer of green beans. Repeat the layers as desired, with bananas as the final layer. Finish by pouring the remaining half of the beaten eggs on top. Bake at 350°F for 30 minutes. Let sit after removing from the oven, so the piñón doesn’t crumble when serving. The ground beef can be substituted for chicken, turkey or soy. If you prefer, try using mixed vegetables in place of the green beans. This recipe can be prepared in individual dishes or in a large cupcake pan to make separate portions. Whether used green or ripe, plantains are a basic element of Caribbean cooking and are also popular throughout Central America. This dish makes a sweet and salty contrast between the bananas and the stir-fried beef, yet it’s also reasonable in price and easy to make. Plantains are a very versatile ingredient; they can be fried, prepared in syrup, stuffed or layered piñón-style, also known as Caribbean lasagna or casserole. 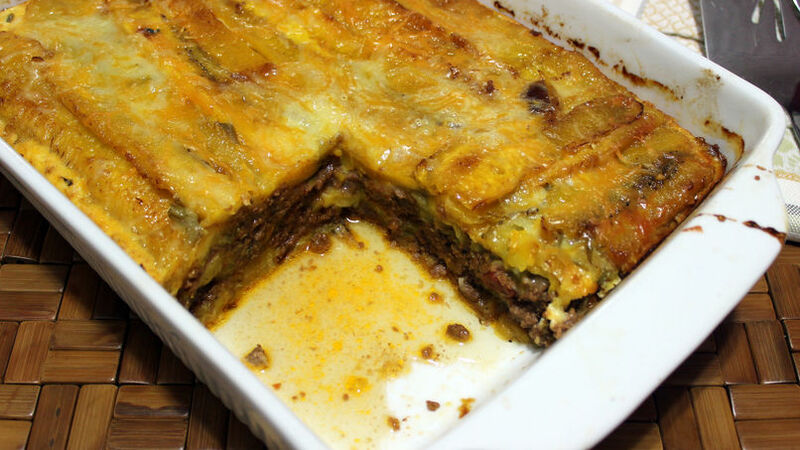 I’m sure that if your family already likes ripe plantains, as well as the traditional lasagna with ground beef, then this recipe will come in handy for you. I hope this new version motivates you to try this delicious recipe with your family.